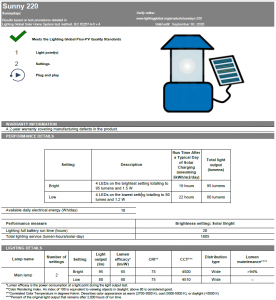 This document describes the feedback received on the revised design of the Standardized Specification Sheets (Spec Sheets) for Lighting Global quality-verified products. With the transition to using the new version of the test methods (IEC/TS 62257-9-5:2018, ed. 4), the Spec Sheets can now report additional information about product performance and capabilities. These new Spec Sheets will be used for products that begin testing after December 1, 2018. Existing Spec Sheets, and Spec Sheets for those products tested to the previous test methods (ed. 3), will only be updated following renewal testing. The revised versions also have a more consistent design between the three main product types: pico-products without charging ports, pico-products with mobile charging, and SHS kits. Examples of the draft Spec Sheets used to solicit comments are available for review. The final versions of these Spec Sheets will include the model number of the product in the header, provide more clarity regarding the “used in combination” column, and include additional details about charging ports.